A woman grieves as family members of victims gather after a 30-year-old attacker killed six people with an axe in Henan province's Gongyi city on September 14. "Jaime's China" is a weekly column about Chinese society and politics. Jaime FlorCruz has lived and worked in China since 1971. He studied Chinese history at Peking University (1977-81) and served as TIME Magazine's Beijing correspondent and bureau chief (1982-2000). Beijing (CNN) -- When an ax-wielding man attacked people on the street in Henan Province on Wednesday, the terse media reports created headlines and public panic. Wang Hongbin, 30, killed six people, including two children, and is said to be mentally ill.
Is this yet another sign of a worsening mental illness in China? We recall last year's alarming stories of five major attacks in Chinese schools, leaving 17 people, including 15 pupils, dead. 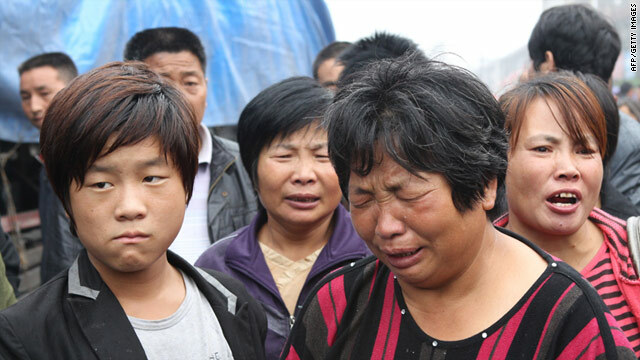 In March, a local resident in Fujian stabbed students, killing eight and injuring five. The suspected attacker, a former community doctor, was suffering from mental illness, the Xinhua report said. Can world business depend on China? In May, Wu Huanming, 48, stabbed students in a private kindergarten in Shanxi province, killing nine people, including seven pupils. According to Xinhua, local police said Wu slumped into depression after suffering several illnesses. Following those grisly attacks, Premier Wen Jiabao pledged that government authorities will beef up security in schools and will address the social issues related to the attacks. These incidents have triggered heated discussions in the Chinese media whether mental illness should be considered mitigating factors in criminal trials. They have also put the spotlight on the state of mental health in China. Are things are getting worse? Dr. Michael Phillips, director of Suicide Research and Prevention Center at Shanghai Jiao Tong University School of Medicine, does not think so. "I expect the recent spate of violence by persons with mental illness is more a reflection of increased press interest than the result of greater frequency of such events," he tells me. "Given the size of the country, these events are going to happen." Phillips has resided and worked in China for more than 20 years. He has co-authored research papers on mental health issues in China, including one on the alarmingly high suicide rate in China. The Canadian psychiatrist says "there is no clear evidence that the prevalence of mental disorders has changed dramatically in the last decade or so" -- with the exception of alcohol abuse. "It's impossible to characterize the mental health of a nation, particularly on the size and diversity of China. My large study with 60,000+ subjects in four provinces found rates of mental illnesses similar to that reported in Europe and North America," he said. Still, the China numbers are staggering. In 2009, according to the Ministry of Health's Center for Statistics Information, psychiatric patients in China totaled nearly 19 million. Yet, there is an acute shortage of medical caregivers. Only 88,117 health personnel were available to provide professional care in 637 psychiatric hospitals. The picture looks alarming from Li Sikun's viewpoint. A psychiatric counselor, she says her privately-run counseling center in Beijing helps urbanites and white-collar workers who mostly suffer from depression and anxiety. "The overheated economic development has made people obsessed with material things at the expense of inner balance," she says. "The world is changing too fast, and people are losing their bearing. It's the same experience many developed countries have been through." Other observers see a darker picture. "Some recent headlines from the past year indicate that untreated mental illness may be becoming a more acute problem in China," writes Wan Yanhai, a medical doctor and health advocate for HIV/Aids prevention in China. In an essay published last January in Foreign Policy, Wan cited last year's grisly attacks on schoolchildren and the suicides of several young workers at a sprawling Foxconn factory assembling iPhones in southern China. "Even as many people who need medical attention are unable to receive help--either because it is too costly or because of the great social stigma attached," he writes, "there are others who are healthy but are labeled 'mentally ill' by authorities seeking a reason to detain them in mental-health hospitals." "I have seen people sent to mental hospitals for being gay, for domestic disputes and for political dissent," he writes. "Many whose lives could be improved will never receive medical attention, and many who don't need it are held in confinement in the name of medicine." Others credit the government for putting new priority on mental health. Along with diabetes and hypertension, Dr. Phillips notes, mental illness is now one of the main targets of a health reform program initiated in 2009. "This is an indication of the level of awareness of the problem at the political level," Dr. Phillips says. The government wants to develop community-based services for the recognition and treatment of mental illnesses." The government has allocated money, but it has yet to build a network of community-based mental health providers. "Given that currently only about 8% of persons with mental illnesses ever seek help, one main goal of prevention efforts is to increase care-seeking; that is, changing attitudes about mental illnesses, so sufferers and their family members are willing to seek help." Until recently, mental illness is a taboo topic in China. Cui Yongyuan, 48, was a popular talk show host on CCTV, well liked for his natural, relaxed style, quite unlike the stiff style of other TV personalities. But for some time Cui stopped his show. "I had suffered depression, a serious case of depression," Cui said in an interview with CCTV in 2005. "I hope everyone will realize there is such an illness. If you have a friend around who has this illness, I hope you will not look down on him. Instead encourage him to see the doctor, who can then help solve the problem." Cui is back on air, hosting a revamped talk show on national television called "Talked to Little Cui."